Pictured at the press conference in Monaghan on Monday 14 May, Cllr. 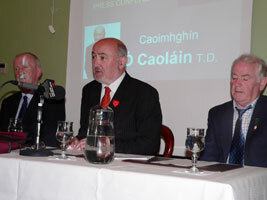 Brian McKenna (Monaghan County Council), Caoimhghín Ó Caoláin TD and Cllr. John Martin (Cootehill Town Council). Sinn Féin has revealed plans by the Health Services executive (HSE) for hospital re-configuration in the North east of the 26 Counties. Speaking on Tuesday, Louth TD Arthur Morgan said the HSE plans, which had come into his possession, showed that the loss of services at Louth Hospital is not about better services but part of a money saving operation. He said people should know Fianna Fáil’s plans for health services as they face into the general election. Speaking at a specially convened Sinn Féin Press Conference in Monaghan, the party’s Dáil Leader and spokesperson on Health, Caoimhghín Ó Caoláin, roundly slammed the planned implementation of the Teamwork Report recommendations. Ó Caoláin presented the media with copies of the document he and party colleagues had received and which spells out in detail, including costings, staff reductions and timeframes, the HSE’s plans to rationalise the acute hospital services in the North East. “It also refers to frontline staff reductions and the savings that will come about as a consequence. 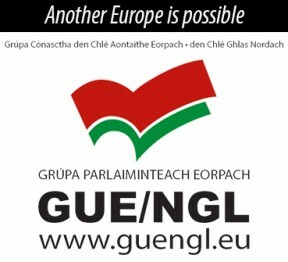 Savings of €2.2 million in 2007 and €5 million in 2008 are projected” said Ó Caoláin. “I call on An Taoiseach Bertie Ahern to immediately intervene and to state categorically to the people of Cavan, of Monaghan, of Meath and of Louth, that he and his party, Fianna Fáil, have at last seen the folly of their approach to acute hospital services and healthcare in general in the North East Region and will withdraw their support for the Hanley/Teamwork proposals and will instead commit their long awaited support for the network of hospitals across this region and throughout the state”, Ó Caoláin said. Arthur Morgan has said the document reveals that Accident & Emergency services, as well as the Intensive Care Unit and all acute medical services will be transferred to the Lourdes hospital from the Louth County Hospital by July 2008. “This will cause great hardship and puts the lives of vulnerable people of the greater Dundalk area at risk particularly the old and the sick. The Louth Hospital has been there since the 1950s providing essential health service. It is ironic given the growing population in the area together with the healthy economy that these services are now being cut”, he said. The Document highlights what it calls ‘major opportunities for savings ..’ and estimates €5 million savings per annum. Job losses are estimated at 48 in the Region. “This proves beyond any doubt that the loss of essential health services is not about better services, but about saving a mere €5 million’, Morgan said. “Again, this exposes this government putting a few miserly euros ahead of peoples’ health. Government TDs are telling people that services at Louth Hospital are safe. This is clearly not the case. I believe it is important that voters know what is planned for hospital services in the North East before casting their votes next week”, he said. Caoimhghín Ó Caoláin said that Sinn Féin will, if in government post the General Election, radically change the direction of healthcare policy in both the Department of Health and Children and in the Health Service Executive. “Democratic accountability will return to the office of the Minister and services will return to our local hospitals. Ours is a vision of healthcare that truly places the patient first and is geared to meeting the needs of communities”, he said.